We are the Minnesota Exclusive Distributor! 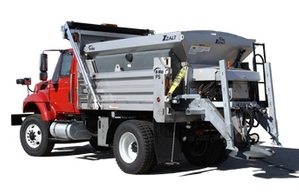 Not your typical salt and sand spreader, the Hi-Way® Xzalt® delivers a 70:30 ratio of dry/liquid material, reducing salt usage while accelerating ice melt. The mixed material delivered produces less material bounce and improves adhesion to the road, virtually eliminating over-application on roadside shoulders. Other features of the Xzalt include a precision directional spinner system which is adjusted by the operator from the comfort of the cab; an enclosed chute with adjustable height to fit various trucks; and sensors equipped at the spinner, liquid pump and conveyor to eliminate guesswork of application rates or controller settings. The maintenance-friendly features of the Xzalt also include sealed bearings, a one-piece conveyor belt and 304 stainless steel components.